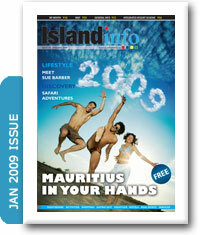 This January 2009, we kick off our Lifestyle section with Sue Barber. If you are thinking of getting away from the hectic hustle and bustle of Europe, or anywhere else for that matter, and moving to Mauritius, then you will find Sue to be a fount of valuable information and the person to talk to. 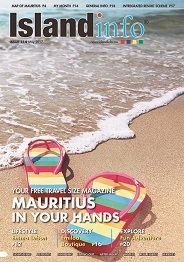 Our Discovery section introduces Safari Adventures Mauritius. Lions, lion cubs and cheetah are the names of the game here, so be sure to pay them a visit while on the island. Going for a walk with a couple of lions at your side is an experience you�ll never forget! January the 26th is Chinese New Year and there is no better time to experience Chinese tradition executed with Mauritian style! The amazing multi-coloured dragons, bright paper lanterns and other sounds and sights of the festival will make you thankful that you experienced two new years this year instead of just one! This month we have part two of �The Life & Times of Alan Grihault�; an interesting tale of determination and perseverance. Be sure to check out last month�s article if you missed part one. Safari Adventures has two new young lions which are full of energy and eager to meet new people. It is a wonderful, once in a life time, experience for anyone. So make a booking now! If you like lions you might just like crocodiles too. Crocod�ile is another great attraction featuring crocodiles of all sizes and is certain to amaze both the old and young alike. Finally, Domaine de l�Etoile features in our Discovery section and offers many recreational activities such as horseback excursions, archery and quad-bike nature trails. Such a small island with so much to offer! 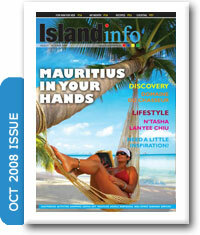 Mauritius, it gets bigger with each visit!! 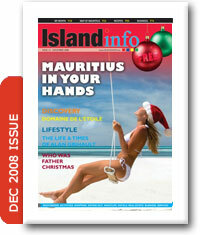 To celebrate Islandinfo�s second year in publication we have a two part Lifestyle special, �The Life and Times of Alan Grihault� teacher, teacher trainer & dodo expert See page 12. November tends to be a quiet month in Mauritius with very few public holidays, but from the 27th to 29th of November in Mah�bourg is held La Regatta � which is anything but quiet! It is a great opportunity for tourists to sample some of the culture and history of the island as scores of pirogues, traditional fishing boats, take to the waters. 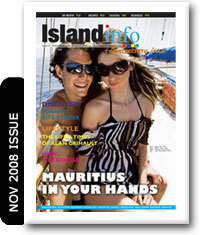 See My Month on page 18. Splashing about in the water is a speciality of Yoaneye Kite Center, on page 26, and anyone who loves water sports should head on over there for some top quality coaching or just some good not at all old-fashioned fun. This month we have a blast of fresh air rifling through our pages as N�Tasha Lan Yee Chiu, the owner of the Thaifoon restaurant, graces our Lifestyle section. Health seems to be on everyone�s minds these days, and the question we are asking this month is �Are all vitamins the same?� Visit our Body and Soul section on page 64 to find out more. BA Investment features in our business section this month and for those of you with some spare cash why not check out the IRS and RES schemes outlined on page 72. October the 31st is Halloween. A time when kids and adults alike can enjoy themselves by dressing up as, but do you know its origins? My Month features an article on Diwali, the Festival of Lights. Can you name each day of the festival?